Star Flyer first calls at Nevis, a small, mountainous island full of authentic Caribbean character and ringed with idyllic beaches. Star Flyer will meet up with Royal Clipper and the ships will sail together to Cabrits, noted for its natural beauty. 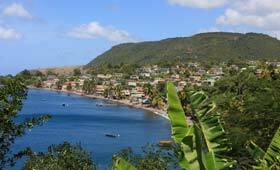 Stroll around Terre-de-Haut, one of the picturesque islands in the Iles des Saintes group and visit the unspoilt harbour of Des Haies on Guadeloupe. Explore the historic island of Antigua, home to the historic Nelson's Dockyard and visit glamorous St Barts, which boasts upmarket boutiques and superb restaurants. Embark your ship in Philipsburg. The freeport capital of the Dutch portion of the island sits beside Great Bay, and has local markets and duty free shops. Star Clipper visits Charlestown, home to beautiful 18th-century colonial buildings, on the island of Nevis. Star Flyer will meet up with Royal Clipper and the ships will sail together to Cabrits in Dominica. Dominica is rich in natural beauty, with waterfalls, rivers, tropical rainforest and numerous rare plants and wildlife. Star Clipper moors at Cabrits, overlooked by the restored Fort Shirley in the Cabrits National Park, and near Dominica's second town of Portsmouth. Terre-de-Haut is the largest and one of only two populated islands in the Iles des Saintes group. With a small nod to tourism, the island is an oasis of tranquillity and as part of Gaudeloupe, has a relaxed, French air. In the town of Bourg, browse the local shops or watch the harbour activity from a waterside cafe. Set in a glorious bay, Des Haies is an unspoilt glimpse of France in the sunshine of the Caribbean. Nearby is a noted Botanical Garden. Falmouth Harbour has a busy yacht marina and is a short walk or taxi-ride from the historic Nelson Dockyard in Antigua's English Harbour. Shops and restaurants can be found near the harbour, and Star Clipper offers a tender service to the local sandy beach. The rocky island of St Barts was a trade port where booty from sea raids was stored or sold. Now it is visited by luxury yachts owned by the world's wealthiest, and the stunning capital of Gustavia has upmarket boutiques and good French restaurants. Inland discover colourful flora and small settlements in the hills and valleys. Disembark your ship in Philipsburg, after a week exploring stunning locations not visited by the large cruise ships. Use of ship's water sports and snorkelling equipment, with support by water sports team. Optional scuba diving may be available. Flights and transfers - please contact us for a quote.